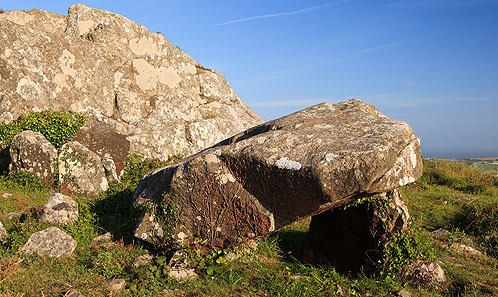 2 Neolithic burial chambers , below the peaks of Carn Llidi. One Consisting of a Capstone , supported by an upright stone over a rock cut pit . Concrete and Brick foundations are in this area , the remains of a WW1 Hydrophone Station (To detect Submarines) , and a WW2 Radio , Observation , and Radar Station .